Like their ancestors, the African Wildcat, domestic cats are programmed to hunt. Each part of the hunting activity – the stalk, pounce, play and kill – releases feel-good hormones called endorphins. Cats need to have frequent successful ‘kills’ to avoid frustration and are most likely to hunt at dawn and dusk. Cats in the wild spend a lot of their time on frequent hunting expeditions, catching up to 12 small rodents per day. In comparison, our pet cats are given bowls of food, so a meal doesn’t take long to eat or make use of their great senses. 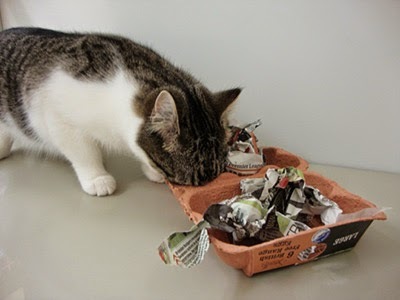 That’s why it’s a good idea to create interest at meal times by hiding food around the house for your cat to search out. Short games for a few minutes frequently throughout the day are also a good idea to mimic the cat's natural hunting activity. Ensure that you spend a few minutes showing your cat how to use new feeding enrichment items so that they get the hang of it. 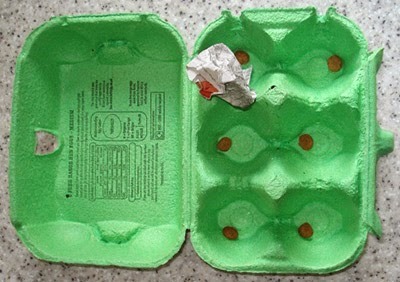 Start with a cardboard egg box that's open and place a portion of your cat’s daily allowance of dry food (if they have dry food) in the egg box for them to paw out. You can build up to more complex enrichment very gradually. 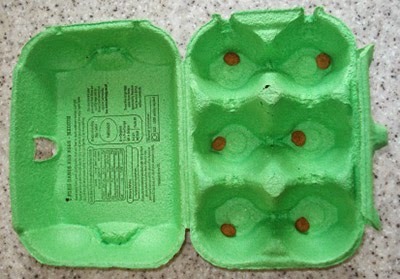 For example, you could slowly start to close the lid of the egg box so your cat has to open it to find the food; or you could loosely scrunch up small pieces of newspaper and wrap the biscuits up. Then let your cat enjoy the food! Use sticky tape to attach cardboard toilet roll tubes together, adjacent in a line. Take further rolls and place them on top to make a second row in a brick-like pattern. Again, tape these to any adjacent rolls. Continue to tape rows of tubes in a descending numbers, to make a pyramid shape or rows of toilet rolls inside a box, as pictured. Remember to use tape on both sides of the pyramid and you could add a cardboard base to make it extra stable. 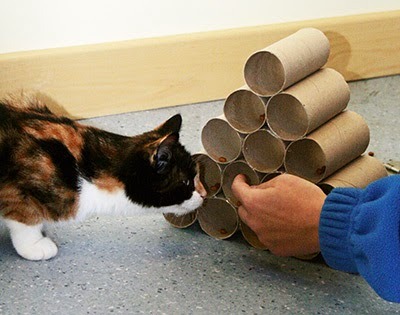 You can teach a cat how to use the toilet roll puzzle by 'pawing' at it with your fingers. Food must be taken out of the cat’s daily amount of weighed biscuits to avoid obesity. Read more about feeding in our leaflet Feeding and obesity. I cut round holes with exacto knife, in the smaller box that cat litter comes in, and put treats and toys inside. The box is made tougher than regular boxes. I take old boxes and reinforce with duct tape, cut holes, windows and doors. Tape some together to make it taller. They love shredded paper in it. Sometimes I just let them destroy the kitchen. I throw piles of paper, paper bags etc. on the floor and they have a blast! The hide under it and attack each other. I bought my cat a treat maze: not interested. I've tried hiding the treats: doesn't care. He loves retrieving a ball with a bell in from inside a toy, but as soon as he's retrieved it, he loses interest and walks away. I've tried enriching his environment but since he has free access (via a microchip cat flap) to the outside, I assume he's satisfying his hunting urges on actual prey. Occasionally he'll bring me a mouse or a still-cheeping baby bird. He loves cardboard so whenever I make him cardboard things, he chews them up and destroys them within minutes. I even made him a 2l lemonade bottle with holes in for his biscuits and he ignored it. Some cats just aren't that into it.